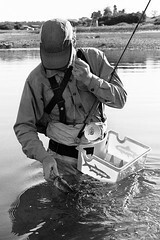 Fly fishing vests, packs, jackets and waders all have been made to accommodate retractors in some form or another. In some cases retractors are being built right into the gear. Retractors are not fly fishing specific. Ski areas issue season passes on retractors. These same retractors are standard in hospitals for doctors and nurses so they can have their security passes ready at all times. I personally haven't developed a "can't do without" need for them as it relates to fly fishing yet but man they seem popular (I have my clippers and hook sharpener attached to basic fly line lanyards). Fly fishing product design seems to demand retractor attachment capability. Do you agree? If so, what kind of retractor do you use (pin back, post, clip, etc.)? If not, why? Regardless of your retractor opinions, what tools are mandatory and how do you attach/store your tools of the trade? I keep a pair of nippers on a zinger on my trout vest and on my saltwater hip pack. I got tired of the cheap-o zingers breaking or falling off, so a couple of seasons ago I broke down and bought a couple of Gear Keeper zingers- they've held up great and were definitely worth the money. I have a magnetic clip for my trout net, and my hemostats just get clipped to the fabric of my vest. In the salt I use a pair of cheap-o $1.99 needlenose pliers (they're on their 3rd season), so I've never bothered with a lanyard. If I had a pair of fancy pliers I'd probably go with one of those phone cord style coiled lanyards, but it is nice to be able to just hand the pliers off to someone in need, so who knows. Everything else I bring with me gets stored inside my vest or pack. Big Sky Taku: Well, being kind of a Luddite, I gave up on retractors after breaking a number of them and losing tools, plus the retractors. With the "good" ones costing upwards of $20.00, I went to using parachute cord that costs a few cents. The only other tool that I occassionaly use is a net that hangs by an old carabiner. Hemo's just get clipped on. I would not buy a vest that had retractors built in since I figure that it would be more expensive, and I would be buying something I don't want. The only other tool I sometimes carry is a leatherman in a pocket. As a design suggestion I would have, have an attachment point (such as the plastic D rings on the older Patagonia mesh vest, with a solid fabric pocket (so the nippers don't get hung up on the mesh like it does now)). In addition, I have been using the Double Haul pack in Florida and Montana and would like to see an easier way to get the hydration bladder into the backpack, and have a place to clip my hemo's onto the shoulder strap with a piece of fabric that would keep them 90% covered up. Will try to send some pics with notes on it sometime soon. For an array of vest types, keeping a simple, strongly designed vest for folks like me, and a bells and whistles loaded one for those that like that type of thing. Thanks for the chance to have some input. I've done the parachute cord/ flyline lanyard deal in the past. I gave up on it, I'd strangle myself, never have the right reach or they'd get all tangled in the bag at the end of the day. A good retractor keeps what yo uneed right where you want it. Tangle and clutter free. Sure a good one can cost up t $20.00 but if I get 10 years use out of it I'm ok with that. For a quick grad and run set up for chasing brookies I love th ebeaded necklace set up, fly box, tippets, clippers on a retractor etc all on one necklace, light and practical. Lot's of variation in the tools comments. I think you'll all be happy with some of the new Spring 2008 product development. We have included attachemnt point needs and tool storage in vest, pack and bag design but in a integral way. The designs work as a whole instead of appearing like a product with whistles and bells stuck on. Thanks Way Upstream team. Keep the conversation going. Retractors are really a deal breaker for me. If it doesn't have a retractor built in, I've already written off the product before I give it a closer look. I'm tying, retying, and retying again tippet and flies for clients all day long, and I'm not going to compromise and fight my gear. As far as I'm concerned, the only thing that I need attached to a zinger is a pair of nippers. I don't need nail knot tools, threaders, or any other crap hanging off of my body, as I don't use them often enough to warrant keeping them out in the open, and hemos come with a built in keeper with the jaws. I think Simms is the only company that really has it dialed in with retractors at the moment. The retractor system on the G3 Waders, G3 Jacket, and Classic Guide Jacket tuck out of the way, take up no room, are lightweight, and are easily accessible. I'm not particularly interested in "attachment points," as I've yet to find an after-market zinger that I'm really happy with. Give me built in retractors, two of them at most. I carry nippers on a retractor on my waders, my vest, my hip pack, and my jacket. When it's pouring down rain I don't want to unzip my jacket to dig out nippers from my waders. After-market zingers are often big and bulky, some are awkward in size and shape, and there's always the possibility they'll come off. I've tried Simms, Fishpond, Gear Keepers, etc. I'm done with them for the time being. Orvis uses a somewhat similar design to Simms' retractor on the Orvis Tailwater XT Jacket, so I guess it's safe to assume that the use of coiled cord retractors isn't patented in a general sense. Retractors are very usefull. I use strong diving string retractors attached to my pontoonboat to hold all necessary gear and instruments securly attached to the boat in de strong saltwater surf. On my vests I am more moderate. It depends on the fish I chase after. The vest that is most decorated and therefore most cumbersome in wearing is the one I use for trout fishing in mountain streams. There I have retractors for pliers, nippers, a small torch, very fine pliers, amadou pouch you name it and if it can be on a retractor I do it. I'm no heroe in the strong icy currents of a mountain stream and changing flies or tippets while balancing I find it usefull that all essential gear is secured by a retractor. My Traun River Products vest comes with two neat retractors built in handsomely and the rest are on phone cords pin-on retractors (Orvis). In all other forms of flyfishing (pike for instance or rudd, ide and bream or even bonefish, tarpon or snook) my vests (if I even use one) are as empty as possible and my gear as least retracted as is wise. I have one pair of nippers that i use wherever i go: boat, stream, surf, etc. I use the simms retractor that is made of the coiled plastic cord, and have a pair of whatever brand nippers on the end of it. I love the design so simple no moving parts etc. It has a pin on the back of it that i pin through my straps on my waders, or to the handle of my great divider bag if i am on the boat, or if i am wet wading i just pin it to my shirt. As far as zingers go I have mixed emotions. They are useful but add ons invariably come off and those incorporated into the designs of vests and packs are often situated in places that grab excess fly line making management an issue. I keep the front of my vest as clean as possible. Really the only thing on the front, aside from the pockets, is the fly drying patch. All other tools are stored within the confines of the vest. I clip the hemos to the fabric on the inside of the vest and store tippet, leaders, and stream thermometer in the inside pockets. A thermometer specific pocket on the inside of the vest orientated vertically is something I havnt seen yet, but it would be useful. Nippers are on an old shoe string around my kneck inside my shirt. I dont like anything grabing fly line that shouldnt (i.e. tools behaving badly). Wading flats I wear a lumbar pack with my shirt tails pulled over it. All tools are inside the pack. Once again its a question of minimizing the risk of anything grabing fly line that shouldnt at an inopportune momment. Thanks Ketan, Jan, Ian and Taco for the "tools" comments. I think you and others with a similar approach to gear will like the Patagonia fishing products coming out in the near future. Functional simplicity remains one of the guiding design philosophies. Stay tuned.